Plunging for Plovers: these brave souls charged into the freezing waters of Long Island Sound last Saturday to raise awareness of efforts to save Plum Island from sale and preserve the island’s outstanding flora and fauna. Photo by Judy Preston. 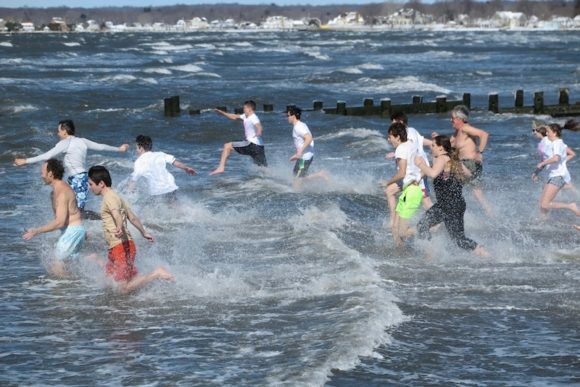 OLD SAYBROOK -– A long-planned “polar plunge”-style fundraiser at Old Saybrook Town Beach got a shot of drama from unexpectedly cold temperatures, strong winds, and high waves this weekend. 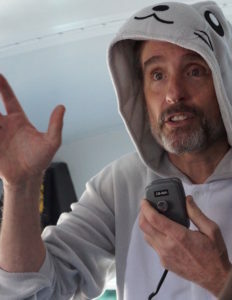 CFE/Save the Sound’s Chris Cryder, in seal costume, speaks at the press conference. Photo by Laura McMillan. 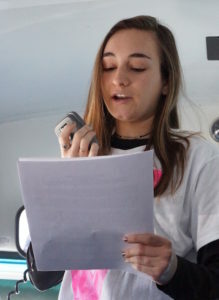 Students from Old Saybrook High School, area officials, and representatives of a regional environmental organization—some in costumes—packed into a heated school bus for a press conference last Saturday morning, March 11, before running into a frigid Long Island Sound to raise awareness and support for protecting Plum Island. 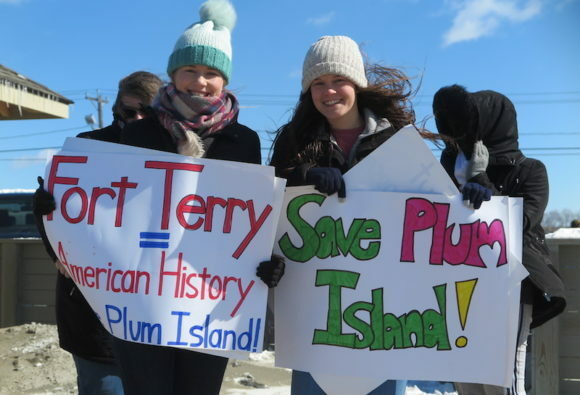 The “Plum Island Plunge for Plovers” has raised $3,700 for Connecticut Fund for the Environment and its bi-state program Save the Sound’s multi-year battle to save Plum Island from sale and private development. Donations are still coming in. Rosie Rothman, co-president of Old Saybrook High School’s Interact Club, speaks at the press conference prior to ‘The Plunge.’ Photo by Judy Preston. Rosie Rothman, co-president of Old Saybrook High School’s Interact Club, explained that the plunge was a perfect fit for the Interact Club’s mission of community service and the Ecology Club’s mission of environmental protection. Senators Richard Blumenthal and Chris Murphy sent letters in support of the effort. Plum Island, an 840-acre, federally-owned island in the eastern end of Long Island Sound, is home to threatened and endangered birds like the piping plover and roseate tern, as well as other rare species. Seventy Connecticut and New York organizations work together as the Preserve Plum Island Coalition, partnering with grassroots activists and champions in Congress to halt sale of the island. CFE/Save the Sound has also brought an action in federal court claiming that the government’s decision to sell the island violates numerous federal environmental laws. Fundraising will remain open through the end of the month. Members of the public may donate to support CFE/Save the Sound’s work at www.bit.ly/plum-plunge.